As my first look at a previously unseen Longhorn build, I chose to document build 4066, a build showcasing many features that were being checked-in for the WinHEC 2004 release, 4074, but were either too buggy or too incomplete to keep. This particular compile was of Standard Server, which speaks more of what was removed from the build as opposed to what was added in. 4066 includes DWM, and it's possible to turn on without any nasty hacks. Merely hit control-shift-F9 as per the Vista beta builds and the jade/glass theme is enabled if you have compatible hardware. The glass is still the same muddy green as you see in 4074; the actual Aero Glass theme was on restricted access at the time so to test the layout and performance only this version was available to most employees. We've all heard the buzzwords like Aurora and Phodeo, but this is the first time you're likely to see both actually implemented in a build. 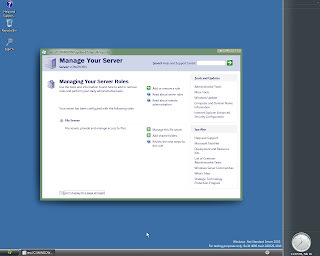 On choosing the "3D view" option you are presented with a new filesystem view - a DirectX-drawn view with an animated aurora effect behind the icons. 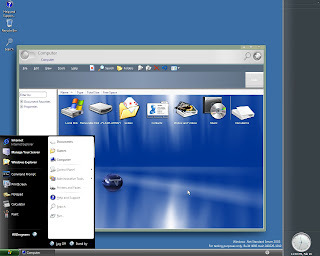 If you choose "Panorama" as the view, you're kicked into a buggy version of Phodeo; a 3D animated grouping of files allowing you to quickly browse through the different groups to find what you want. This is not the first time it's been seen - 4039 also included Phodeo but without the Aurora background. This build also includes other niceties, like a special mini version of Windows Media Player and some WMP sidebar tiles. In the run-up to 4074 all the labs were checking in their code to winmain as evidenced by 4066, but some features had to be cut out completely. 4074 completely lacks the 3D file view and with that, the feature was shelved indefinitely. 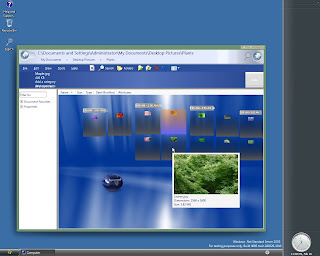 Another editor added the Phodeo image to the Development Of Windows Vista article on Wikipedia. I would like to request your permission to use it, as it is an important peice of longhorn history. Thank you. +Dejco The link is dead. Could ya reupload plz?